Here is the list of the hotels near Urval. Book your hotel near Urval today, Thursday 09 May for the best price, reservation and cancellation free of charge thanks to our partner Booking.com, leader in on-line hotels reservation. Below here is the list the 50 closest hotels of Urval, sortable according your criteria. You will find the position of these accommodations on the Urval hotels map. Les Cabanes du Tertre is located 6 km Le Buisson and its train station and 35 km from Sarlat-la-Canéda. The wooden cabins have a full kitchen and a private bathroom, and some offer an infrared sauna. The accommodation will provide you with a flat-screen TV, a DVD player and a balcony. The kitchen features a dishwasher and towels and bed linen are provided. A restaurant and supermarket can be found 3 km away. This holiday home is 35 km from Roumanière Airport and some hiking paths can be found 200 metres away. Guest can enjoy canoeing 3 km away and there is free on-site parking. Located in Urval, Gite Lou Peyrol features accommodation with free WiFi, seating area and a kitchenette. Offering garden views, all units come with a washing machine, coffee machine, a flat-screen TV, ironing facilities and a living room. A dishwasher, a microwave and toaster are also featured, as well as a kettle. The holiday home offers an outdoor pool. This property offers a children's playground and a terrace. Sarlat-la-Canéda is 34 km from Gite Lou Peyrol. The nearest airport is Bergerac-Roumanière Airport, 45 km from the property. Set in Siorac-en-Périgord, 22 km from Sarlat-la-Canéda, Domaine de la Dame Blanche features an outdoor pool and a terrace. Some rooms include a seating area for your convenience. Each room is fitted with a private bathroom. Domaine de la Dame Blanche features free WiFi throughout the property. You can play table tennis at this guest house, and the area is popular for cycling and hiking. Bike rental is available 10 km away. Beynac-et-Cazenac is 20 km away. Périgueux is 47 km from Domaine de la Dame Blanche, while Bergerac is 38 km from the property. The nearest airport is Bergerac-Roumanière Airport, 35 km from the property. Set within a 2-hectare garden, Le Clos Lascazes offers guest rooms in a 17th-Century house. It features an outdoor swimming pool and on-site badminton and the Dordogne River is just 2 km away. Elegantly decorated, all rooms feature views of the pool or garden, a flat-screen TV and tea and coffee making facilities. A hairdryer is also provided in the en suite bathroom. A continental breakfast serving homemade pastries and jams is available at the B&B and can be served inside or on the terrace. Guests can also sample local Perigourdine specialities upon request. Additional features include a sitting room with a TV, books and board games. Bergerac is just a 45-minute drive from the property and free private parking is available on site. Located in Paleyrac, Le Domaine De Pecany offers accommodation with free WiFi and flat-screen TV. Some units also have a kitchen equipped with a dishwasher. Guests at the holiday home can enjoy a continental breakfast. Le Domaine De Pecany offers a seasonal outdoor pool. A barbecue can be found at the accommodation, along with a terrace. Sarlat-la-Canéda is 33 km from Le Domaine De Pecany. Bergerac-Roumanière Airport is 42 km away. Bed and Breakfast Siorac-en-Périgord Preferred hotel ! Situated in Siorac-en-Périgord, Les Deux Tours features accommodation with an outdoor pool, free bikes and barbecue facilities. Complimentary WiFi is provided. Some units feature a seating area and/or a terrace. A continental breakfast is served daily at the property. The bed and breakfast offers a children's playground. If you would like to discover the area, cycling is possible in the surroundings and the property can arrange a bicycle rental service. Sarlat-la-Canéda is 31 km from Les Deux Tours. The nearest airport is Bergerac-Roumanière Airport, 49 km from the property. Offering a seasonal outdoor swimming pool, La Prairie is located in Siorac-en-Périgord and offers holiday houses set in an old stone farmhouse. Free WiFi access is available and a welcome drink is served on arrival. Each holiday home has a terrace, a fully equipped kitchen with a dishwasher, and a bathroom with a shower. You can enjoy pool views and garden views from each house. Just 1 km from La Prairie, guests can find some shops. Barbecue facilities are available on site. Sarlat-la-Caneda is 30 minutes’ drive from the property and Bergerac is 45 km away. There is free parking on site. Hotel Siorac-en-Périgord Preferred hotel ! The Trèfle à Quatre Feuilles is a typical regional Hotel, located in the heart of the Périgord Noir. The Hotel offers comfortable rooms with free Wi-Fi internet access. All the rooms were refurbished in 2009. Trèfle à Quatre Feuilles also offers a regional cuisine served on a shaded terrace in summer, and next to the fireplace in winter. Set in a 15th-century house within a 3-hectare park, Manoir de La Brunie is located 2 km from Siorac-en-Périgord and offers B&B accommodation. You can relax on the furnished terrace and enjoy the outdoor swimming pool. All of the heated rooms at Manoir de La Brunie are decorated with antique furniture and parquet floors. Each room also features a private bathroom with a bath or a shower. A continental breakfast is included and served each morning in the dining room. Traditional dinners are also available, upon prior reservation. There is a common living room with a piano and another with a TV. Free Wi-Fi is provided throughout the property. Free private parking is also possible on site and the B&B is 40 km form Bergerac. L’escale sits on the banks of the Dordogne River and offers beautiful views, especially from the terrace, of the river and the surrounding countryside. Double and family rooms are provided all overlooking the garden, with river views and access to the riverbank.The en suite bathrooms are equipped with a bathtub and/or shower. A continental breakfast is served daily. Guests can enjoy an ice cream or have a glass of local wine at the bar, or on the terrace. There is also a hot stone restaurant on site. L’escale offers free Wi-Fi access in public areas and free private parking. It is 25 km from Sarlat and 40 km from Bergerac. Local activities include fishing, cycling and golf. Guests can also rent a canoe right next to L’escale and discover the area by river. Guest accommodation Saint-Pardoux-et-Vielvic Preferred hotel ! Domaine de la Bessede is set in Saint-Pardoux-et-Vielvic. Free WiFi is featured. All units feature a satellite flat-screen TV, a private bathroom with shower and a fully equipped kitchenette. Some units feature a terrace and/or a balcony with pool or garden views. The holiday park offers an outdoor pool. If you would like to discover the area, cycling, fishing and hiking are possible in the surroundings. Sarlat-la-Canéda is 39 km from Domaine de la Bessede. The nearest airport is Bergerac-Roumanière Airport, 49 km from the property. Set in a 19th-century manor along the Dordogne River, Le Manoir de Bellerive offers a 4-hectare tree filled park, an outdoor swimming pool viewing the river and a tennis court. Guests can also relax in the property's sauna or hammam. The rooms at Le Manoir De Bellerive are elegantly decorated. Air-conditioned, they each have free WiFi access, satellite LED TV, telephone, minibar, heating and safe. A buffet breakfast is served every morning, which you can also enjoy continental-style in the comfort of your room. The bar also provides a pleasant spot to relax with a drink before dining in the property's restaurant. Free private parking is available on site and Buisson-de-Cadouin Train Station is 1km away. Transfer to and from the train station is free. Overlooking the valley of the Dordogne, this hotel welcomes you in a countryside setting and offers the ideal backdrop for a restful stay. The Hotel Le Petit Chaperon Rouge features 9 guest rooms fitted with all the modern comfort, Wi-Fi Internet access, flat-screen television and en suite bathroom. Traditional, tasty specialities and home-made cuisine are served at the hotels restaurant or on the terrace shaded by lime trees when the weather is fine. Set in Marcousin in the Aquitaine region, Maison De Vacances - Siorac-En-Périgord has a terrace. This holiday home also features free WiFi. The holiday home includes a kitchen with a dishwasher and an oven, as well as a coffee machine. A TV and DVD player are featured. The holiday home offers an outdoor pool. A children's playground is also available at Maison De Vacances - Siorac-En-Périgord, while guests can also relax in the garden. Sarlat-la-Canéda is 30 km from the accommodation, while Bergerac is 48 km away. The nearest airport is Bergerac-Roumanière Airport, 48 km from the property. 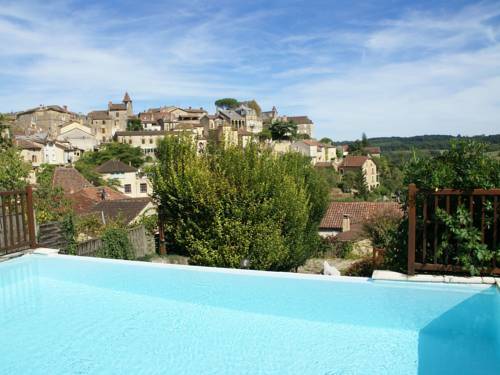 Situated in Siorac-en-Périgord, Maison De Vacances - Siorac-En-Perigord offers accommodation with a private pool. Guests have a private terrace. The holiday home includes 5 bedrooms, a kitchen with a dishwasher and an oven, as well as a coffee machine. A TV is available. The holiday home offers an outdoor pool. This property features a barbecue and a children's playground. Sarlat-la-Canéda is 30 km from Maison De Vacances - Siorac-En-Perigord. Bergerac-Roumanière Airport is 48 km away. Situated in Coux-et-Bigaroque, 35 km from Sarlat-la-Canéda, La Douce Dordogne offers a seasonal outdoor swimming pool and free WiFi. Some units include a dining area and/or a terrace. A buffet breakfast is served daily at the property. At the bed and breakfast guests are welcome to take advantage of a hot tub. Guests can also relax in the garden. Périgueux is 53 km from La Douce Dordogne, while Bergerac is 43 km away. Bergerac-Roumanière Airport is 43 km from the property. Featuring a seasonal outdoor swimming pool, Gite la Buissonniére features accommodation in Le Buisson de Cadouin with free WiFi and pool views. The holiday home has garden views and is 25 km from Sarlat-la-Canéda. Gite la Buissonniére features a flat-screen TV, a well-equipped kitchen with a dishwasher and an oven, and a bathroom with a bath and a hair dryer. Gite la Buissonniére offers a terrace. Guests can also relax in the garden. Périgueux is 41 km from Gite la Buissonniére. Bergerac-Roumanière Airport is 31 km from the property. Set in the heart of Périgord Noir, Ferme de Lagrave is a guest house offering a garden with a panoramic view of the valley and river, as well as an outdoor swimming pool, a terrace and free Wi-Fi access in all areas. Rooms at Ferme de Lagrave feature a seating area, a TV and an electric kettle. The bathrooms have a hairdryer and free toiletries. Some rooms overlook the swimming pool and the garden. In the morning, a breakfast including homemade cakes and jams is served. Proumeyssac Chasm is 9-minute drive away and the Prehistorical town of Les Eyzies-de-Tayac can be visited 12 km from this property, which offers free parking and is 12 km from Buisson Train Station. Situated in Belvès, Le Tambourinet features a garden and free WiFi. Guests can make use of a terrace. All units in the guest house are fitted with a kettle. The rooms are equipped with a private bathroom with a shower, free toiletries and a hair dryer. Guest rooms feature a wardrobe. A continental breakfast is served daily at the property. Sarlat-la-Canéda is 35 km from Le Tambourinet, while Saint-Sauveur is 44 km away. The nearest airport is Bergerac-Roumanière Airport, 52 km from the property. Located in Mouzens, Maison De Vacances - Coux-Et-Bigaroque features accommodation with a private pool. Guests staying at this holiday home have access to a fully equipped kitchen. Opening onto a terrace, the holiday home consists of 4 bedrooms. A TV and a DVD player are featured. The holiday home offers an outdoor pool. Guests can relax in the garden at the property. Sarlat-la-Canéda is 34 km from Maison De Vacances - Coux-Et-Bigaroque. The nearest airport is Bergerac-Roumanière Airport, 47 km from the accommodation. Maison Saint Bernard is set in Cadouin and offers a garden. This property offers access to a terrace and free WiFi. This 2-bedroom holiday home comes with a kitchen, a seating area, and a satellite flat-screen TV. Hiking can be enjoyed nearby. Sarlat-la-Canéda is 41 km from the holiday home, while Bergerac is 40 km from the property. The nearest airport is Bergerac-Roumanière Airport, 41 km from Maison Saint Bernard. Maison MARTY is located in Marcousin and offers a seasonal outdoor swimming pool, barbecue facilities and a garden. Including a bar, this holiday home also has a restaurant. This 4-bedroom holiday home comes with a kitchen, a seating area, a dining area and a flat-screen TV. Sarlat-la-Canéda is 30 km from the holiday home, while Bergerac is 50 km away. Bergerac-Roumanière Airport is 50 km from the property. Located in the popular Dordogne river valley in the Perigord Noir, Aquitaine Region, this detached holiday home features a sun terrace and garden with views. It features an outdoor seating area with a barbecue, a dining area, and a kitchen equipped with cooking tools and a dishwasher. Sarlat-la-Canéda is 18 km from Gîte Le Recoux, Les Eyzies 14km away, and Rocamadour is 50 km from the property. The nearest airport is Bergerac-Roumanière Airport, 38 km from the property. Bordeaux and Toulouse airports are about 2 hours' drive away. Popular farmer's markets are available in all nearby towns as well as famous evening gourmet markets. Bed and Breakfast Cadouin Preferred hotel ! Les Songes de l’Abbaye B&B is set in a 14th-century building with a view of the UNESCO World Heritage Site, Cadouin Abbey. It is located in the centre of Cadouin and offers rooms with free WiFi access, featuring a mix of antique and modern décor. Each bright room is equipped with a TV and a telephone. Every bathroom has a shower. Continental breakfast, featuring regional products, is served daily and guests have access to the living room and the kitchen. You will find several hiking trails passing through the village and the owners will be happy to recommend gastronomic restaurants and tourist sites in the area. Le Pigeonnier is set in Saint-Germain-de-Belvès and offers water sports facilities. Providing free WiFi, the property also has a tennis court. The holiday home features a terrace, 1 bedroom, a living room and a well-equipped kitchen with a dishwasher and an oven. The holiday home offers a barbecue. Guests at this property can enjoy horse riding nearby, or make the most of the garden. Sarlat-la-Canéda is 29 km from Le Pigeonnier. The nearest airport is Bergerac-Roumanière Airport, 50 km from the property. Villa Marguerite is set in a manor house in the village of Cadouin, 300 metres from Cadouin Abbey. It is decorated with antique furniture and breakfast can be taken on the shaded terrace in the garden or by the fireplace in the dining room. Each room has a traditional decoration with antique furniture and a seating area. Free Wi-Fi access is provided and all of the rooms offer a view. The en suite bathrooms are fitted with a shower. The dining room at this B&B features a fireplace and you can relax in the library, which displays decorative objects from the 20th century. Most of the furniture and decorations in the sitting room are available to purchase. The vineyards of Bergerac are 40 km from this property and the medieval village of Sarlat is 35 km away. Free public parking is possible on site. Located in Cadouin, Chambre d'hôtes Ancienne Gendarmerie is set in a house dating back to 1606, just 200 metres from Cadouin Abbey. It offers a garden with furnished terrace and free Wi-Fi. The guest rooms have an en suite bathroom with hairdryer and shower. Guests can relax with a book by the fireplace in the common living room offering exposed stone-walls and wooden beams. Every morning, a continental breakfast is served. Restaurants can be found in Cadouin, just 400 metres away. Guests can enjoy tea/coffee making facilities in the shared living room. Free public parking is possible at a location nearby. Access to the Dordogne River is just a 10-minute drive away and there is pond just 1 km away from the property. Bergerac is located 36 km away. Located in Coux-et-Bigaroque, 33 km from Sarlat-la-Canéda, Camping le Clou provides a seasonal outdoor swimming pool and free WiFi. There is also a kitchen in some of the units equipped with a microwave, a fridge, and a stovetop. Guests can enjoy a meal at the in-house restaurant, which serves a variety of Mediterranean, French and Dutch dishes and also offers dairy-free, gluten-free and vegetarian options. The camping offers a terrace. Bergerac is 49 km from Camping le Clou, while Saint-Sauveur is 41 km away. The nearest airport is Bergerac-Roumanière Airport, 49 km from the property. Situated in Meynard, Country Camp Camping Le Clou offers accommodation with seating area. The units have a fully equipped kitchen with a fridge, coffee machine, and a stovetop. The tented camp offers a children's playground. A garden and a terrace are featured at Country Camp Camping Le Clou. Sarlat-la-Canéda is 33 km from the accommodation, while Bergerac is 49 km away. Bergerac-Roumanière Airport is 49 km from the property. Maison De Vacances - Belvès is located in Belvès. This holiday home features a private pool, a garden and barbecue facilities. With free WiFi, this holiday home offers a TV, a washing machine and a kitchen with dishwasher. The holiday home offers an outdoor pool. A children's playground is available on site and horse riding can be enjoyed within close proximity of Maison De Vacances - Belvès. Sarlat-la-Canéda is 34 km from the accommodation, while Saint-Sauveur is 44 km away. The nearest airport is Bergerac-Roumanière Airport, 52 km from the property. Lasting from the XIth and XIIh centuries, this former village grocery shop has been transformed into a 3 stars hotel. You will find a great originality in the conception of the bedrooms because each of them takes you to another country, especially the one located on the garden level with a vaulted ceiling : the medieval magic while enjoying today’s comfort. The rooms on the back benefit from an extraordinary view on the surrounding countryside. All the bedrooms offer individual air conditioning. Situated in Belvès, Maison De Vacances - Belves 3 features accommodation with a private pool. Complimentary WiFi is featured. The holiday home includes 5 bedrooms and a kitchen with a dishwasher and a coffee machine. A TV is available. The holiday home offers an outdoor pool. A barbecue can be found at Maison De Vacances - Belves 3, along with a garden. Sarlat-la-Canéda is 34 km from the accommodation, while Saint-Sauveur is 44 km from the property. Bergerac-Roumanière Airport is 52 km away. Situated in Belvès, Maison De Vacances - Belves 2 features a private pool. The accommodation is 34 km from Sarlat-la-Canéda. Providing access to a terrace, the holiday home consists of 4 bedrooms and a fully equipped kitchen. A TV is featured. The holiday home offers an outdoor pool. Maison De Vacances - Belves 2 provides a barbecue. Saint-Sauveur is 44 km from the accommodation, while Gourdon-en-quercy is 41 km away. The nearest airport is Bergerac-Roumanière Airport, 52 km from Maison De Vacances - Belves 2. Situated in Belvès in the Aquitaine region, Maison romantique dans les bois has a garden. Guests are welcome to go for a swim in the outdoor pool. This holiday home comes with a living room and a fully equipped kitchen with a dishwasher. A TV is provided. The holiday home offers a barbecue. Horse riding is possible within the area and the property offers water sports facilities. Sarlat-la-Canéda is 37 km from Maison romantique dans les bois. The nearest airport is Bergerac-Roumanière Airport, 52 km from the accommodation. La Dépendance is located in Saint-Germain-de-Belvès and offers water sports facilities, a tennis court and a garden. Guests staying at this holiday home have access to a fully equipped kitchen. With direct access to a terrace, the holiday home consists of 4 bedrooms. The holiday home offers an outdoor pool. Horse riding can be enjoyed nearby. Sarlat-la-Canéda is 29 km from La Dépendance, while Souillac is 50 km away. The nearest airport is Bergerac-Roumanière Airport, 50 km from the accommodation. Boasting a garden, an outdoor pool and pool views, La Côte is situated in Belvès. This holiday home also features free WiFi. The holiday home has a satellite flat-screen TV and a living room. The holiday home also includes a well-equipped kitchenette with an oven, a microwave and a fridge, as well as a a hair dryer. The holiday home offers a terrace. Hiking can be enjoyed nearby. Sarlat-la-Canéda is 34 km from La Côte, while Saint-Sauveur is 44 km away. The nearest airport is Bergerac-Roumanière Airport, 52 km from the accommodation. Maison De Vacances - Belves 1 is situated in Larzac and offers barbecue facilities, a garden and a terrace. Complimentary WiFi is offered. The holiday home features 3 bedrooms and a fully fitted kitchen with a dishwasher. A TV is provided. The holiday home offers an outdoor pool. Sarlat-la-Canéda is 37 km from Maison De Vacances - Belves 1, while Bergerac is 50 km away. Bergerac-Roumanière Airport is 50 km from the property. Located in Bouillac, Gîte Champ de Rivière en Périgord features a private pool. This holiday home provides accommodation with a terrace and free WiFi. This holiday home with pool views has 3 bathrooms with a shower. A flat-screen TV with satellite channels is available. The holiday home offers an outdoor pool. A barbecue and a children's playground are available for guests at Gîte Champ de Rivière en Périgord to use. Sarlat-la-Canéda is 43 km from the accommodation. The nearest airport is Bergerac-Roumanière Airport, 44 km from the property. Featuring air-conditioned accommodation with a terrace, Villa Les Bernadoux is located in Marnac. The villa, set in a building dating from 2008, features free WiFi. This 5-bedroom villa comes with a seating area, a flat-screen TV, a Blu-ray player and a kitchen with a dishwasher. Sarlat-la-Canéda is 26 km from the villa. The nearest airport is Bergerac-Roumanière Airport, 50 km from the property. Featuring free WiFi, a seasonal outdoor pool and a terrace, Chambres D'Hôtes Les Boudines offers pet-friendly accommodation in Saint-Germain-de-Belvès, 17 km from Sarlat-la-Canéda. Free private parking is available on site. An array of activities is offered in the area, such as golfing and hiking. Rocamadour is 47 km from Chambres D'Hôtes Les Boudines, while Périgueux is 49 km from the property. Roumanière Airport is 41 km away. Offering an outdoor pool, AU COEUR DE LOLHM is located in Buisson De Cadouin, 28 km from Sarlat-la-Canéda. Périgueux is 41 km away. The property offers a stone holiday home, safari tents, guest rooms and a chalet in a park. Featuring a terrace, All units feature a kitchen fitted with a dishwasher, an oven, and a microwave as well as a dining area and a furnished terrace. There is a private bathroom with a shower in each accommodation. Bed linen and towels are available at an extra cost. AU COEUR DE LOLHM also includes a barbecue. Bergerac is 30 km from AU COEUR DE LOLHM. Bergerac-Roumanière Airport is 28 km from the property. Located 3 km from Belvès just 7 km from the Dordogne River, RCN Camping Moulin de la Pique features 4 outdoor swimming pools just 100 metres from La Nauze stream and a fishing pond. The mobile homes have barbecue facilities, a terrace and a private bathroom. They are also furnished with a fully equipped kitchen with microwave. Guests can enjoy the onsite restaurant and the snack bar. There is also a mini market which offers fresh bread every day. The camping also has a football table, a volleyball court and a tennis court. A children's playground and laundry facilities are also available. Cottage de la Mothe offers holiday homes set near the Dordogne River in a 1-acre park, There, guests will find an outdoor swimming pool, as well as a seating area with a fireplace. Each accommodation at Cottage de la Mothe offers a bathroom with either a shower or a bath tub. There is a washing machine, ironing facilities and free Wi-Fi access is available in all areas. Meals can be prepared in a fully equipped kitchen or with barbecue facilities. They will be enjoyed in the dining area or on the outdoor furnished terrace. In Marnac, just 2.3 km away, guests will find stores. This property’s location makes it an excellent base to discover Dordogne, Sarlat-la-Canéda being a 26-minute drive away. Free parking is possible on site. Located in Larzac, within a 6-hectare estate, Domaine du Champ de l’Hoste offers a fitness room, massages, an outdoor salt water swimming pool, hot tub and bowling pitch. There is also free WiFi and Sarlat-le-Canéda is a 40-minute drive away. All 3 of the rooms feature a private terrace, flat-screen TV and private bathroom with a hairdryer and free toiletries. The cottage is equipped with a kitchen, living room, fireplace and 3 bedrooms, each with an en suite bathroom. A continental breakfast is provided each morning for those in the guest rooms. Gabarre Boat Trips can be found just a 10-minute drive away on the Dordogne River and 2 golf courses can be found within 10 km of the property. Free private parking is possible on site. Situated in Cadouin, Chambres d' Hotes Rastaillou offers accommodation with free WiFi. A continental breakfast is served daily at the property. The bed and breakfast offers a seasonal outdoor pool. Chambres d' Hotes Rastaillou has a barbecue and a garden, which can be enjoyed by guests if the weather permits. Sarlat-la-Canéda is 48 km from the accommodation, while Bergerac is 39 km from the property. Bergerac-Roumanière Airport is 39 km away. Guest accommodation Belvès Preferred hotel ! In the heart of the Périgord region, on a hill overlooking the Nauze Valley, Village vacances Les Hauts de Lastours offers self-catering accommodation, an outdoor swimming pool, and free Wi-Fi in public areas. The en suite mobile homes and houses have a terrace, a flat-screen TV, individual heating and a fireplace. BBQ facilities, kitchenware, an oven and stove, and a refrigerator are also provided. Facilities to play tennis, ping pong and pétanque are available on site. Fishing and hiking are also possible on site and Village vacances Les Hauts de Lastours proposes entertainment. Village vacances Les Hauts de Lastours is 2 km from Belvès Train Station and 56 km from Bergerac Airport. Free private parking is provided on site. Bed and Breakfast Berbiguières Preferred hotel ! Set in Berbiguières, 15 km from Sarlat-la-Canéda, Les chambres de la Nouvelle Aliénor includes free WiFi access. Free private parking is available. Some rooms feature a seating area where you can relax. You will find a kettle in the room. Every room is equipped with a private bathroom and a terrace. Some rooms provide a kitchenette. There is a shared lounge at the property. Table d'Hotes can be provided upon prior request. You can engage in various activities, such as golfing, horse riding and cycling. Rocamadour is 46 km from Les chambres de la Nouvelle Aliénor, while Périgueux is 46 km from the property. Bergerac-Roumanière Airport is 41 km away. Boasting a garden, a seasonal outdoor pool and river views, Gîte du Coudougnol is situated in Saint-Avit-Rivière. Guests staying at this country house have access to free WiFi and a fully equipped kitchenette. The country house comes with a flat-screen TV. The country house offers a terrace. If you would like to discover the area, cycling is possible in the surroundings. Sarlat-la-Canéda is 49 km from Gîte du Coudougnol. Bergerac-Roumanière Airport is 41 km from the property. Below here is the hotels map of Urval. Names and details of Urval hotels can be shown on the map clicking on the prices icons.